The Munster CEO suggested that ‘common sense’ would make Anthony Foley the favourite to replace Rob Penney. Garret Fitzgerald at UL today. MUNSTER CEO GARRET Fitzgerald today praised the ‘experience’ of forwards coach Anthony Foley with the former number eight a firm favourite to take over as head coach next season. The southern province were last week left with a position to fill when Rob Penney declined the third year on offer and instead took up a position in Japanese club rugby. Fitzgerald today confirmed that presenting an improved offer to Penney above the terms agreed in 2012 “wasn’t considered” and the Kiwi coach would take up a longer term deal. Fitzgerald also moved to rule out any possibility of installing double Heineken Cup-winning former coach Declan Kidney as a director of rugby, saying that the coaching structure at the province would not be changed. Munster are working together with the IRFU to appoint Penney’s successor and Fitzgerald says he has ‘a number’ of applications on his desk for the centrally contracted role. However, after Foley made it to the final three considered for the job in 2012 he must be very close again this time around. “Well I think anyone in any job, if they spend longer doing it, will be more experienced. “The last time when we had the search for a coach, Anthony was in the final three and did exceptionally well at the time. He’s worked exceptionally well with Tony [McGahan] and with Rob. He’s worked at national level and he’s getting much more experience. “He’s getting wiser all the time. If you ask me ‘When is a person sufficiently experienced?’ At some stage you have to get the head coach position. Anthony will get the head coach position, be it here or if he has offers elsewhere – that has to be taken into account. – Additional reporting by Murray Kinsella. 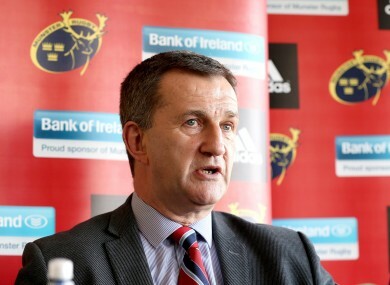 Email “No room for Kidney as director in Munster structure -- Fitzgerald”. Feedback on “No room for Kidney as director in Munster structure -- Fitzgerald”.